Although they have only been around since 2011, eLeaf has made a considerable impact in the vaping marketplace thanks to the their popular iStick mods and iJust tank series. With the eLeaf iJust S Tank, the brand is positioning itself for more success by appealing to sub ohm Vapers who like to keep things simple. 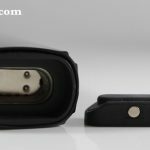 A detailed review on the iJust S tank and its components. Sub ohm vaping is all about providing intense flavor and vapor volume. If a tank fails to deliver those two things, game over. To accomplish these primary goals a sub tank needs to do a few things exceptionally well, and the iJust S Tank from eLeaf gets high marks in all of them. The only drawback is that the airflow is not adjustable. The first of these is airflow, and the iJust utilizes an airflow design that is new to eLeaf tanks. The slot is not adjustable, but provides a great airflow that feels comfortable when inhaling. 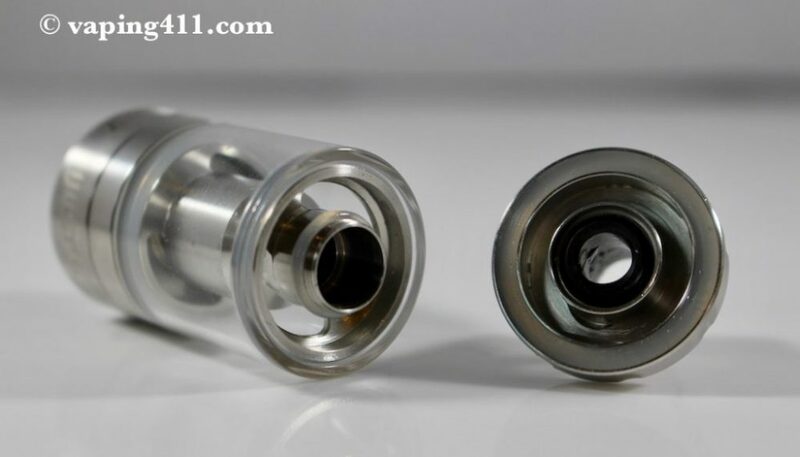 The same can be said for the slots which funnel e-juice to the tank’s coil architecture. These larger inlet holes make it easier for e-juice to flow which results in a smoother draw with more flavor. Vapers can make the necessary adjustments to get bigger clouds, increased flavor, or that nice mixture of both that is the Holy Grail for cloud chasers. The top fill design makes it easy to fill the tank with ejuice. A third vital component is heating. To get the best flavor and vapor volume heat needs to be dispersed in an efficient and effective manner. The tank supports dual SS316 coils and includes an ECL 0.18 ohm head. This coil is also new to eLeaf and does a more than adequate job of supplying heat. Dimensions are approximately 1″ x 2.5″. A 4ml e-juice capacity and top-fill system. One look at those specs tells you the general build of the tank is status quo. As mentioned above, it is the subtler aspects which make this tank stand out. There is one big plus regarding how the tank is put together. All of the various components are easily dissembled for cleaning. The mouthpiece, top cap, glass tube, air pipe, atomizer head, and atomizer base can all be separated, and you won’t need a STEM degree to put everything back together again. According to eLeaf, the iJust S Tank is compatible with Atlantis, Triton, or cCell coil heads. 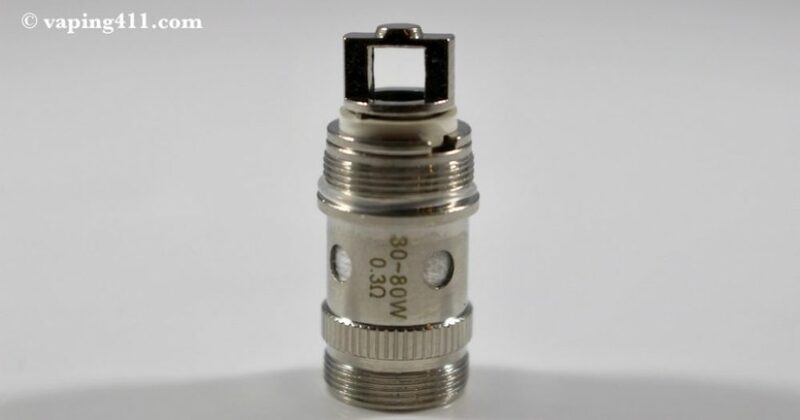 Vapers will probably want to stick with the pre-installed ECL 0.18 ohm head, however, because of the larger inlets. This coil head is also compatible with VW, Bypass, Smart, TC-SS, and TCR modes. The iJust S tank comes with a 0.3 ohm EC Coil (Pre-Installed). Replacements for the ECL 0.18 ohm head are available from eLeaf. Depending on how often one vapes, a new head will be required every three weeks or so. These heads use 100% organic cotton which helps to prevent impurities than can affect taste, and vaping at a high wattage can be done without e-liquids tasting burnt or bitter. If you are searching for a simple tank that performs without a hiccup, the iJust S Tank is an affordable choice. It’s sort of refreshing to see that eLeaf has distilled the perfection of this unit down to the most rudimentary elements while preserving a standard of quality that is typically the exclusive domain of more expensive tanks. The iJust S is a simple and easy to use sub ohm tank that simply works great. It has become one of my favorite tanks because it consistently performs well. 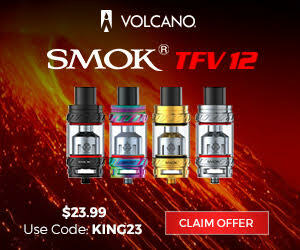 It is also very affordable and a great tank to get if you are new to sub ohm vaping.